The heroine of Mistress of the Revolution, Gabrielle de Montserrat, has arrived in Paris as a teenage widow. The next step is her “presentation” at Court. What were the requirements to be presented at Court? You had to (1) prove that your family had been noble since at least the year 1400, and (2) find another lady, herself presented, who would introduce you to the Queen, King and princes of the royal blood. Gabrielle has no trouble in this regard: her family belongs of the most ancient nobility, and her friend and cousin the Duchess d’Arpajon proposes to act as her presenting lady. The presentation of a lady occurred in the Salon of the Nobles, which served as a sort of throne room for the Queen. 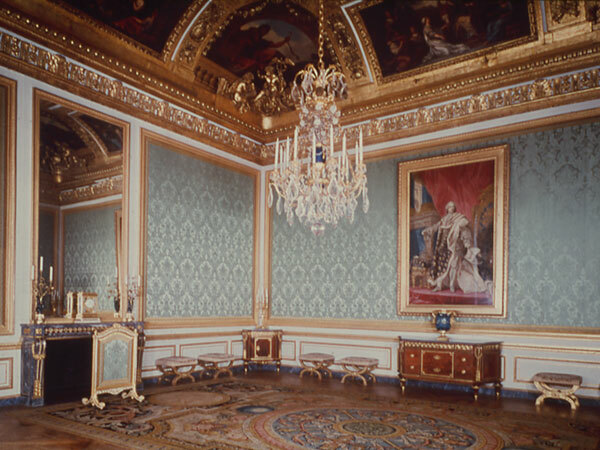 This particular room in Versailles has been recently restored and the furniture in this picture is the one chosen by Marie-Antoinette herself. We walked to the doors of the Salon of the Nobles, where dozens of ladies were crowded, their bulky paniers pressed against each other. The colours of their gowns jarred against the apple-green damask that covered the walls. This remark helped me remember that Marie-Antoinette, though she was the Queen, was not exempt from the petty vanities shared by many women. My heartbeat quieted and my composure returned. I followed the Duchess into the salon. The crowd parted to make way for us. All eyes were on me, and not all were friendly. At last I saw the Queen standing at the far end of the room. She was dressed in a blue gown embroidered with sapphires and diamonds. I tried to remember what my late husband had said of her. She did have an elongated face, a thick lower lip, bulging blue eyes and ruddy cheeks, either naturally or from too much rouge. Yet what her features lacked in fineness was compensated by the majesty of her countenance. She was almost as tall as I, but rather stout. Her breasts seemed ready to burst out of her glittering bodice. I advanced towards the Queen, pausing three times to curtsey. Then, bowing until my forehead almost touched the floor, I removed my right glove and seized the hem of the Queen’s gown to bring it to my lips. The Duchess, during our rehearsals, had warned me that Her Majesty never allowed any lady to complete that part of the ritual. The Queen, with a tap of her fan, did withdraw her skirt before I had time to kiss it. I put on my glove, rose and, careful not to trip on my own train, walked backwards in the direction of the Duchess. My presentation to the Queen was over. My sources here were the Memoirs of the Marquise de La Tour Du Pin, lady-in-waiting to Marie-Antoinette (to whom I owe the bit of advice about keeping clear of the windows) and those of the Comtesse de Genlis.